Welcome home to Glenwood Hills. Spacious 3 bedroom (plus office) single story retreat nested at the base of the Sandia mountains. Spacious great room with direct vent fireplace and soaring wood ceilings. Eat-in kitchen boasts stainless steel appliances and granite counter tops. Large office and a paneled sun room. Private master suite complete with double shower, dual vanities and large closet. Two more huge bedrooms have their own walk-in-closets too! Thoughtful upgrades: Clerestory windows, tile and engineered wood floors (no carpet) and tons of storage. Outdoor patio overlooks private yard full of mature landscaping and fruit trees. Just blocks from tennis courts and world class hiking. Perfection is here! 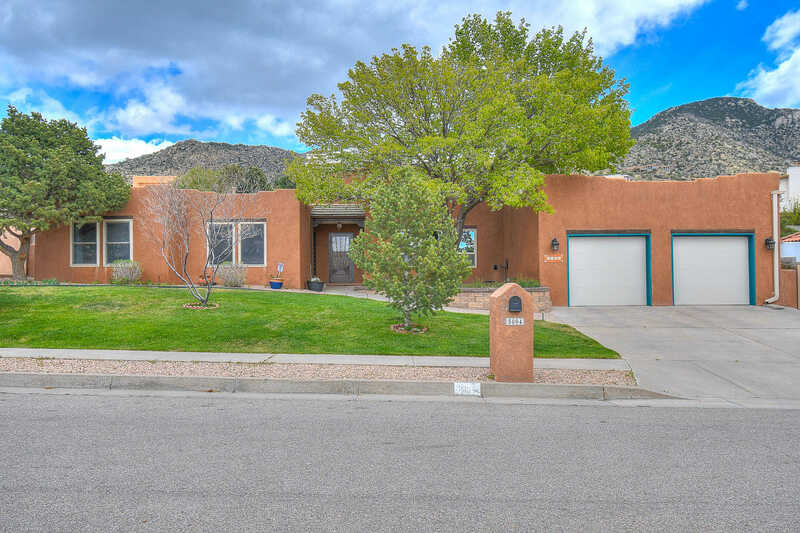 Please, send me more information on this property: MLS# 941676 – $450,000 – 5004 Calle Alta Ne, Albuquerque, NM 87111.